The level of commerce that is associated with rock and roll is something that is best not thought about. It’s sort of like the old line that you never want to go into the kitchen of a restaurant—regardless of whether it has three Michelin stars or it is a McDonald’s—because you’re likely not to have much of an appetite as a result of what you’ll discover. So it is best that we enjoy the filet—or the Filet o’ Fish—without much consideration beyond the object itself. It is best that we enjoy the work of our performers without knowing what it is that has gotten them in front of us, assuming, of course, that the performers in question are those who have visibility that is perceptible beyond a small group of like minds. But sometimes it is bracing to see how things are. Sort of sounds like that Skynet from the Terminator movies. Or, to take another science fictional analogy, the Borg. Resistance is futile. 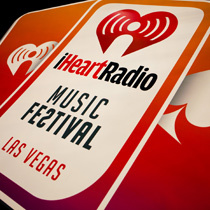 This past weekend Clear Channel launched iHeartRadio, its competitor to Pandora. And it just didn’t hold a press conference followed by a cocktail party. Rather, it held a two-day event at the MGM Grand in Las Vegas. It calls it the “inaugural iHeartRadio Music Festival.” A music festival in a stadium in a casino seems a bit odd, but there it was. The event started with the Black Eyed Peas. It closed with Lady Gaga. And in between there were performers ranging from Jay-Z to Sting, from Kelly Clarkson to Jeff Beck, from Jane’s Addiction to Kenny Chesney. It was hosted by Ryan Seacrest. That’s entertainment circa 2011. Sure, it’s long been this way. Just not so widely and well packaged. My advice: Stay out of the kitchen.